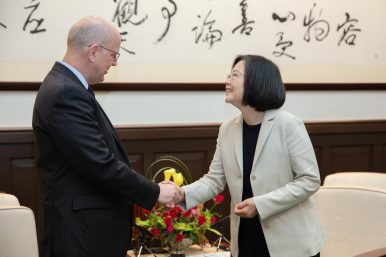 President Tsai Ing-wen (right) greets U.S. Deputy Assistant Secretary David Meale in Taipei, April 12, 2019. Taiwan will continue to welcome officials from the United States to the island as the two countries commemorate the 40th anniversary of the Taiwan Relations Act (TRA), passed in 1979 shortly after the United States severed diplomatic relations with Taipei and established ties with Beijing. A 26-member United States delegation headed by former Speaker of the U.S. House of Representatives Paul Ryan is scheduled to arrive in Taiwan on Monday to attend events commemorating the TRA and to open the new compound of the American Institute in Taiwan (AIT), according to the AIT and Taiwan’s Ministry of Foreign Affairs (MOFA). Earlier this week, Taiwan President Tsai Ing-wen welcomed U.S. Deputy Assistant Secretary for Trade Policy David Meale to a banquet at AIT. Meale said during the event that the United States “will remain steadfast in all of its commitments to Taiwan,” citing the shared economic interests and democratic values of the United States and Taiwan. Taiwan and the United States have put a heavy emphasis on their relationship as of late as both nations navigate their respective tense relationships with Beijing. Last week, Chinese People’s Liberation Army (PLA) fighter jets entered Taiwanese airspace, drawing a sharp rebuke from Taiwan. One week earlier, the United States sent Navy and Coast Guard ships through the Taiwan Strait for the third time in 2019, a move seen by observers as a means of pressuring China, which objects to U.S. passages through the waterway. The unofficial yet robust bilateral relationship between Taiwan and the United States will also be put under the microscope domestically as Tsai, who faces a tough battle for re-election in January, touts her administration’s closeness to the United States as a foreign policy success story. Some politicians from the opposition Kuomintang (KMT), who favor warmer ties with Beijing, have been critical of Tsai’s reliance on the United States in recent weeks. On Wednesday, however, a jovial Tsai expressed her appreciation of the TRA as a foundation for the substantial U.S.-Taiwan relations that have persevered since the administration of then-U.S. President Jimmy Carter decided in 1979 to recognize the government of the People’s Republic of China (PRC). The TRA allowed for the incorporation of the AIT in Taipei, which serves as a de facto embassy and is staffed by U.S. State Department officials. It has since facilitated decades of economic and cultural cooperation between the two nations. More recently, the Taiwan Travel Act, passed in March 2018, encouraged visits by high-level U.S. officials to Taiwan but so far, hasn’t resulted in the Holy Grail of a cabinet-level official heading to Taiwan. The delegation visiting Taiwan next week — helmed by Ryan and including U.S. congressmen Hank Johnson, Eddie Bernice Johnson, Salud Carbajal, and Don Bacon — represents a much more common exchange involving members of the U.S. Congress. Taiwan’s Ministry of Foreign Affairs has said it welcomes the upcoming visit, which was announced after the House Foreign Affairs Committee passed two resolutions on Tuesday in support of Taiwan’s defense and its participation in international organizations, which has been increasingly restricted due to pressure from Beijing. The TRA, which was passed amid concerns that the diplomatic switch would revoke an existing security treaty signed by the United States and Taiwan, also asserts the right of the United States to decide to defend Taiwan and contains language encouraging the United States to provide Taiwan with arms. Taiwan recently made a request to purchase F-16V fighters and M1 Abrams tanks from the United States, and U.S. defense contractor Raytheon was awarded two military contracts in March to continue supporting existing Taiwan Air Force and Navy projects. Last month, the controversial and Beijing-friendly Han visited Hong Kong, Macau, and China and met with PRC government officials, drawing heavy criticism from DPP politicians back in Taiwan. Chinese officials have refused to hold talks with DPP officials since Tsai’s election in 2016. On Thursday, Han told a forum at Harvard University that Taiwan and China should pursue peace rather than dragging the United States into conflicts. “We cannot, and should not, drag our American friends down due to ineffective handling of cross-strait relations,” he said.